People sometimes compare teenagers to toddlers in their behavior. 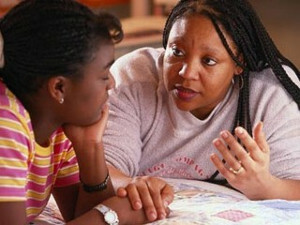 Teens can be very self-centered and strive for independence as they move toward adulthood. It's a normal stage of development though frustrating for parents as this independence can often appear in the form of rude and disrespectful behavior. Along with providing clear and consistent consequences, there's also a few other things to keep in mind when parenting your teen. Try not to overreact to their behavior. The more kids push your buttons and cause you to react, the more they will want to push your buttons again and again. Kids often thrive on the power they gain from controlling a parent's emotions. This need for control may arise if a child feels powerless at school or in their peer group. Brush off some of the rude behavior unless there is a direct, insulting comment or inappropriate behavior toward another person. The calmer you remain through all this, the less reward your child will get from her behavior. For example, if you ask her a question and she brushes past you without answering, let it go if it's not too important. Later, when you're calm, you might talk with her about her behavior. Use consequences. On the other hand, if your child hurts someone with a direct comment or action (i.e. threatens a sibling), you should have a consequence set up that you can calmly give him. You might take his cell phone away for the rest of the day or restrict time out with friends. It's a good idea to set up a consequences when everybody is calm, and involve your child in the process. Hold a family meeting and have your child participate in choosing the best consequence for his behavior. Behavior contracts work well for this. Set up a behavior contract with your child. When the unacceptable behavior occurs, calmly state the consequence and drop it. Don't argue, don't lecture..calmly refer to the behavior contract and that's, that. And don't forget to lead by example. If you become disrespectful and rude, you are giving your child permission for this behavior. You need to model the behavior that you would like to see in her. Also, when you notice her doing a great job, tell her. We all love to hear positive feedback, and she may continue the positive behavior to get more positive feedback! With a little patience and consistency, you can create a healthy and stable relationship with your teen.